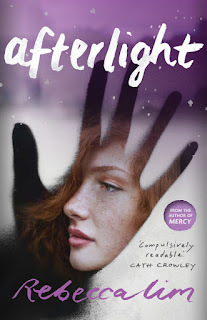 Jo Burnell recently chatted with author Rebecca Lim and asked her about her recent YA novel, Afterlight, published by Text Publishing. Afterlight throbs with beyond-life uniqueness, despite the market being saturated with supernatural themes. Where did you begin in your search for something different? I’ve always written these slightly freaky books for children and young adults that feature empowered female characters living in a fictional world that — as much as possible — resembles the real world I live in and not the one depicted in, say, Neighbours. If you read one of my stories — no matter if you’re three or eighteen— you’ll be met with girls from different socio-economic and ethnic backgrounds finding reserves of strength, ferocity, tenacity and adaptability in the face of great adversity. So as a starting point, the real world always inspires any fiction I create. But my fictional universe is also packed with demons, archangels, monsters and Norman knights because I always proceed on the basis that Anything is possible and that real magic exists. The news is a potent trigger for a lot of my work. A few of my novels are fictional responses to some terrible abduction, cold case and imprisonment stories that were emerging around the time I was writing the books. The things people do to each other in real life are staggering, and I write to try and make sense of questions like: Why do bad things happen to good people? What happens to human energy and consciousness after death? Are we ruled by fate or by our own free will? How does one bad past act reverberate into the future? Afterlight had its genesis in a terrible shooting that occurred in the Melbourne CBD a few years ago. A bikie and a tabletop dancer were involved. Innocent people on their way to work were critically injured or killed. My outrage about violence against women is an underlying theme in most of my books for young adults. Female lives matter. Your ghosts are so three-dimensional, I can imagine meeting them. Have you had close personal experiences with the other side to be able to describe them so clearly? What techniques do you employ to bring spirits to vibrant life? I’ve never spoken much about it until Afterlight came out, but I had a ‘visit’ once, as a child, from a shining presence that stood over my bed (that I don’t think I imagined/hallucinated/dreamed). It’s one of those weird, defining things that—as a highly rational, scientific, logical person—has always stuck with me. What if there are things out there that we can’t explain? And what if something you couldn’t explain came to you and asked for help and sent your life in a completely new direction? That was another impetus for Afterlight. I’ve also read a lot of very arcane books because I’m just interested in different things and all that arcane reading feeds into my writing. Being human is complicated. I use supernatural foils to interrogate what it means to be human, I guess. But other than that one childhood incident, I’ve led a remarkably boring life. I’m just glad I’m not one of those ‘people who sees dead people’ like Sophie and Jordan from Afterlight are. I’d be a basketcase. I know the streets you describe, have seen that house on the edge of the railway tracks. Did you have any qualms about setting Sophie’s story in Melbourne? I’ve lived all over Melbourne and it’s boringly obvious that I love this city. I’ve set my books in places like Paris and Milan, Macchu Picchu and small town USA, but nothing gives me more of a thrill than having my characters literally running for their lives through places I’ve known and loved for years. The walking trail that runs alongside Merri Creek is pivotal to the last stages of Afterlight and it’s one of the eeriest places you’ll ever encounter in the dead of winter when streamers of plastic are hanging from low-lying branches and you’re the only soul around. Your fast-paced action scenes are like watching a movie without the screen, your villains drip danger. Do you also write crime? Tell us about your coming releases. Mercy as well as The Astrologer’s Daughter have been billed as YA crime/thrillers. But I write these genre-crossing things that are also paranormal action/mysteries with a touch of romance as well. At the moment I’m finalising the next book in the Mercy series, Wraith. I’m loving being back in her universe of archangels and demons and deeply flawed people.There are a couple of other things on the boil (one for middle readers and one for adults) that I’m hoping will struggle into the light of day as well. Here’s hoping. 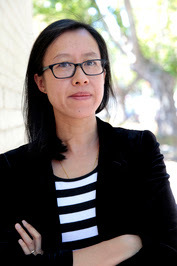 Rebecca Lim is a writer and illustrator based in Melbourne, Australia, with a background in commercial law. Rebecca is the author of sixteen books for children and young adult readers, including The Astrologer’s Daughter (a Kirkus Best Book of 2015) and Afterlight. Shortlisted for the Prime Minister’s Literary Award, Aurealis Award, INDIEFAB Book of the YearAward and Davitt Award for best YA, Rebecca’s work has also been longlisted for the Gold Inky Award, the David Gemmell Legend Award and the CBCA Book of the Year Award for Older Readers. Her novels have been translated into German, French, Turkish, Portuguese and Polish.